Wall Charts, Posters and More! The Click! Colours help people and teams build relationships quick, by understanding what makes people tick! They are used all over the world by companies such as Chevron, BHP Billiton, Johnson & Johnson and McDonalds to improve relationships, communication, teamwork, leadership and decision-making. The Click! Colours Discovery Cards represent the next generation of personality tools and offer a better, faster, cheaper and easier way to help people and teams understand and value diversity in their organisations. Use the Click! 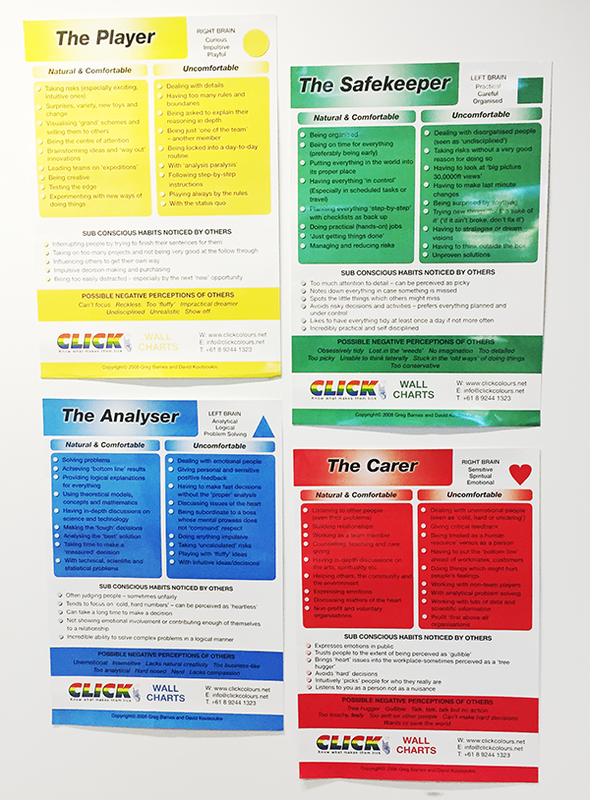 Colours Discovery Cards at home or in your workplace to boost relationships and teamwork by helping people understand themselves and others. .
Click! 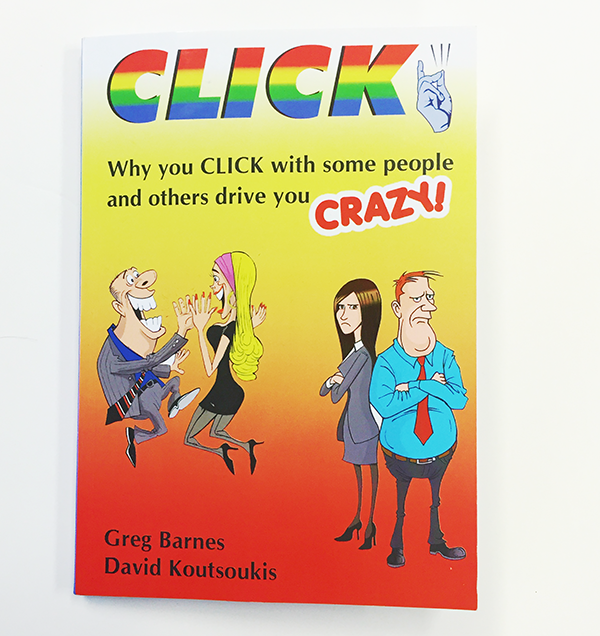 Why you CLICK with some people and others drive you CRAZY! The Book A powerful story to help you understand people's behaviour and boost success and happiness in your work and in life..
Large versions of the Click! 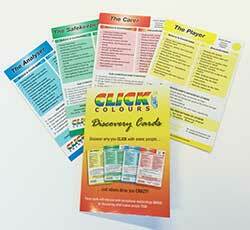 Colours Discovery cards. Great for facilitating Click! Colours workshops or for display in your workplace..
Make the Click! Colours live on in your workplace place with colourful Click! 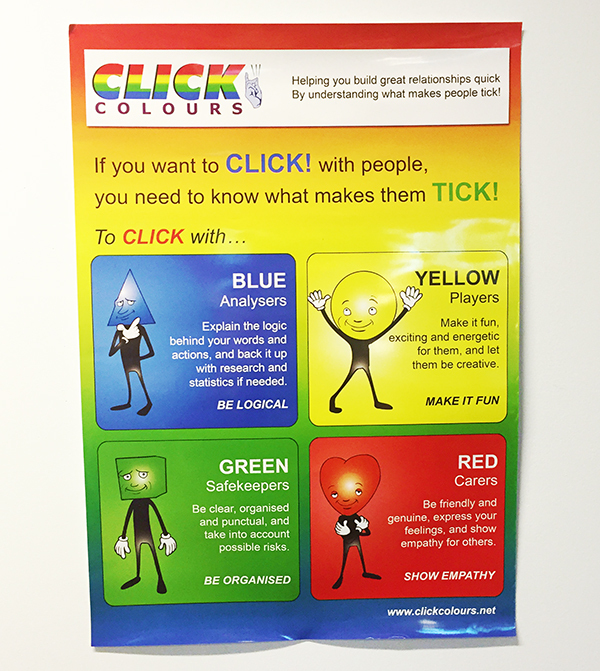 Colours posters that will remind your people that to build great relationships quick, you need to understand what makes people tick!. For those interested in a deeper understanding of Click Colours, the accreditation option is for you! NEW! 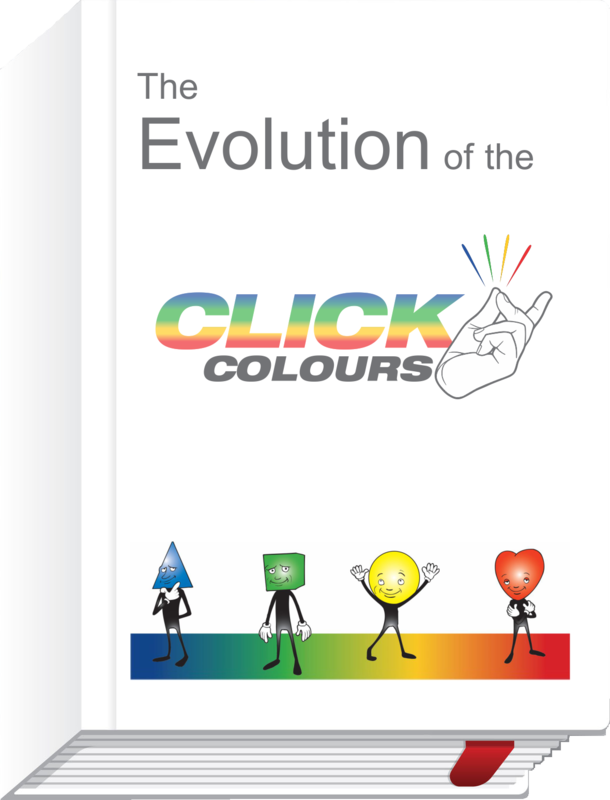 Download our free eBook The Evolution of the Click! Colours It outlines the philosophy behind the Click! Colours and includes a timeline history of personality concepts, tools and models. Great teams - be they leadership teams, project teams, or natural work teams - are built on trust and understanding. The Click! Colours will help you leverage diversity to build great teams both at work and at home. Thank goodness for the wisdom in these pages (Click! The Book) - they've kept me sane as I've come face to face with some of the most diverse personalities in the world. Anyone who has to deal with people who can frustrate, aggravate and generally drive you crackers, will appreciate the message. Great relationships are essential for success, so everyone needs to know why we ‘click’ with some people and others drive us crazy! I highly recommend Click! to anyone who wants to build stronger relationships.